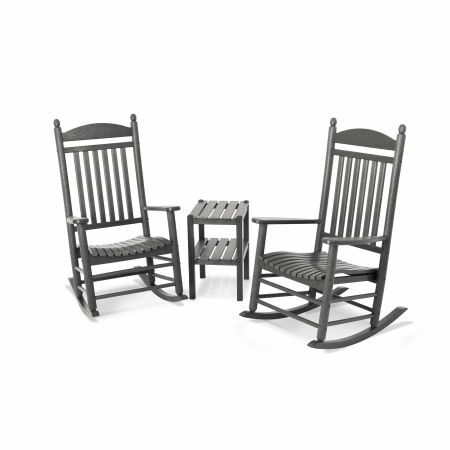 Take a lazy weekend afternoon outside to the next level with POLYWOOD® Resin Outdoor Rocking Chairs. We don’t believe in waste. That’s why we transform post-consumer plastic bottles into stylish, long-lasting, outdoor furniture. 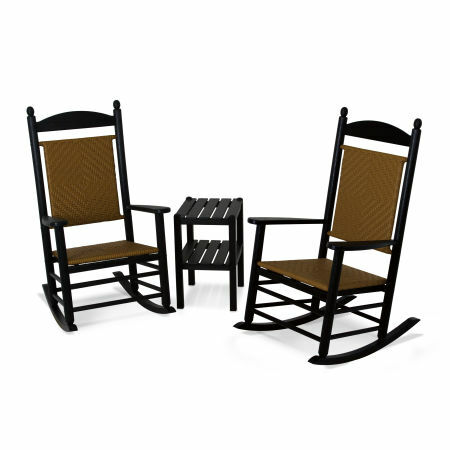 Watch the world go by or lull yourself to sleep with the fluid motion of these comfortable, yet durable, rocking chairs. Rest a little easier knowing they are virtually maintenance-free. 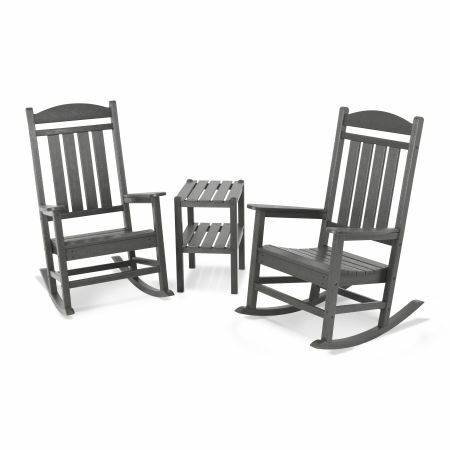 Eco-friendly POLYWOOD® Rocking Chairs are made from a type of polyethylene resin (essentially a hard plastic composite) called high-density polyethylene (HDPE). 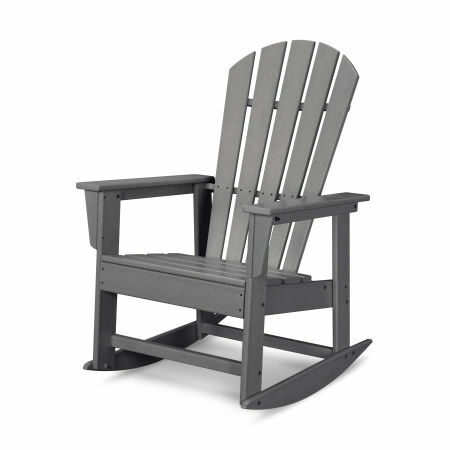 This material is derived from recycled plastic that makes POLYWOOD® Outdoor Rocking Chairs especially weather-resistant. You’ll never have to worry about waterproofing, staining, or painting, and they’ll never fall victim to insect damage, rot, peeling, chipping, or splintering. If the weather turns foul, you don’t need to cover or shelter your chairs. Our unique mix of purified polymers and UV-inhibited pigment systems ensure that your chairs will remain just as sturdy and attractive the day you purchased them, regardless of harsh weather. Cleaning is simple as well. Just use soap and water and give it a good rinse to return your rocking chair to its original glory. 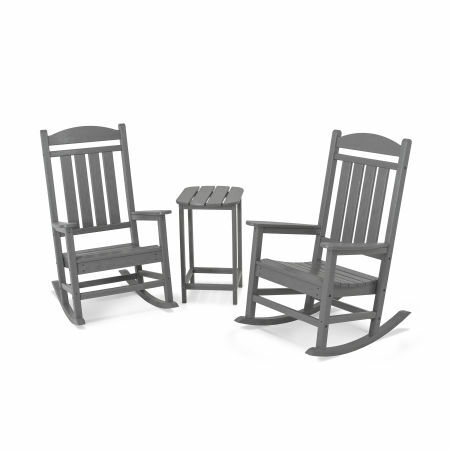 Our resin outdoor rocking chairs are available in a variety of colors and styles. 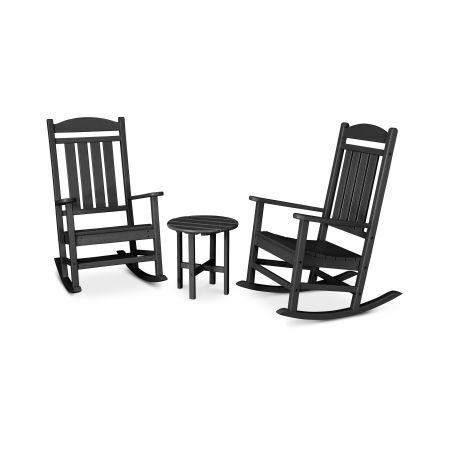 From classics like Adirondack chairs to more contemporary styles, you’ll be sure to find an outdoor rocking chair that will suit your porch or patio perfectly. Update your patio with striking resin rocking chairs with elegant woven backs and swivel bottoms for a fresh, modern look that’s equal parts style and comfort. Choose from a vast variety of colors that will fit with any outdoor theme. Deciding between a few shades? Contact our Customer Experience Team for a free color sample to decide in person if it fits with the vision for your outdoor space. When you invest in a POLYWOOD® product you’re not only purchasing a high-quality piece of furniture, you’re investing in the future of our planet.